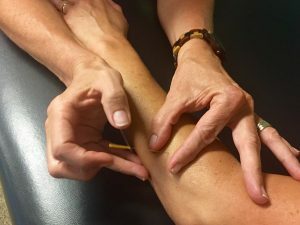 Trigger Point Dry Needling is a technique performed by specially trained Physical Therapists using a very fine filament needle inserted into the areas of the muscle known as trigger points. This technique uses a “dry” needle, with no injectable solution. The needle itself and the effects it produces within the tissue is the actual treatment. Trigger Point Dry Needling is not acupuncture, which is based on Traditional Chinese Medicine and performed by acupuncturists. It is based on Western Medicine principles targeting trigger points in muscles and is supported by significant medical research. An injury to a muscle caused by repetitive use or acute trauma can result in inflammation from the damaged tissue. Damaged muscle tissue will go into a protective tension state in an attempt to guard against further damage. These tight bands, also referred to as trigger points, can limit the muscle’s ability to function properly and can lead to other ailments. One may or may not feel the insertion of the needle, but the needle is intended to produce a local twitch response from the targeted trigger point. This is followed by a brief, dull ache that travels through the muscle, typically lasting only 3 to 5 secs. Many patients report a muscle soreness post treatment that is similar to an overworked muscle. This can last between several hours or up to two days. The benefits however, are that even after one treatment, clients have reported improvements such as decreased pain, improved range of motion and greater ease of movement. Trigger Point Dry Needling has become an effective adjunct to the Physical Therapy treatment of many musculoskeletal conditions including: neck, back and shoulder pain, tennis/golfers elbow, headaches, hip, gluteal and knee pain, Achilles tendonitis, plantar fasciitis, muscular strains and ligament strains. Trigger Point Dry Needling Treatment is offered at all Axis Sports Medicine Locations in Summit and Eagle County. To schedule an appointment or ask any questions please contact any one of our clinics.